The “Skillz” Development program is a fun and exciting way for players of all ages, to hone the skills of their game. Each week the players will go through a combination of small group skill work, skill stations, and situation drills. 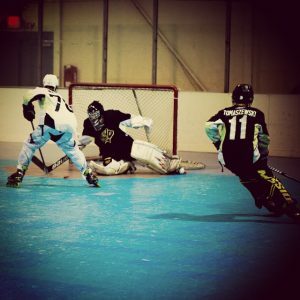 Players are required to wear appropriate hockey equipment, including a helmet with face-mask, mouth guard, elbow pads, gloves, shin guards, pants (no tears), and Inline hockey skates. Sticks must be taped appropriately. If the stick has been used outdoors, please re-tape before using on our surface. We are unable to offer make-up sessions for any classes missed due to personal schedule conflicts including team practices. Players will not be permitted to skate in any session or class other than what they are enrolled for. In the event the Skills Director is unavailable for a class, we reserve the right to substitute a qualified instructor to take his place, or the class will be rescheduled. Get a head start! Click Here to learn how to put on your gear! or Click Here to follow our CCSA Youtube Channel giving you access to drills, tips, and tricks. Click here to visit our calendar for all of our up-to-date events. Adults interested in taking part can register for our Adult Learn to Play Hockey.